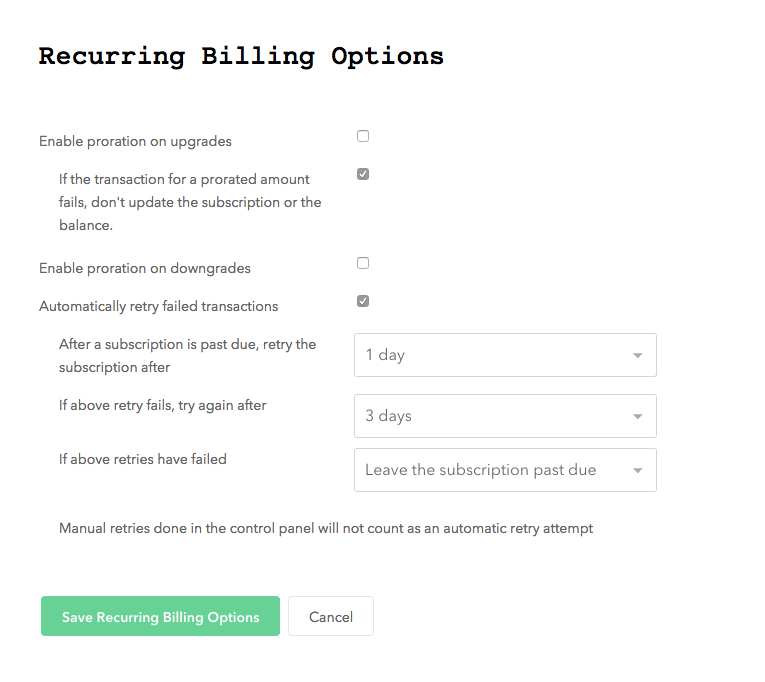 While Churn Buster can add additional retries to your failed payment recovery campaigns, it's important to set Braintree retry settings so they work optimally with Churn Buster. This allows Churn Buster to run longer campaigns, since the customer won't get canceled by Braintree while still being emailed for a missed payment. It's important to have a predictable retry schedule in-place, that will position a couple retries before Churn Buster sends the first email in your campaign. This often can recover soft-failures without emailing anyone. Our recommended settings are 1 day, 3 days, then finally "Leave the subscription past due." If it's not already checked, click on "Automatically retry failed transactions"
Click "Save Recurring Billing Options"